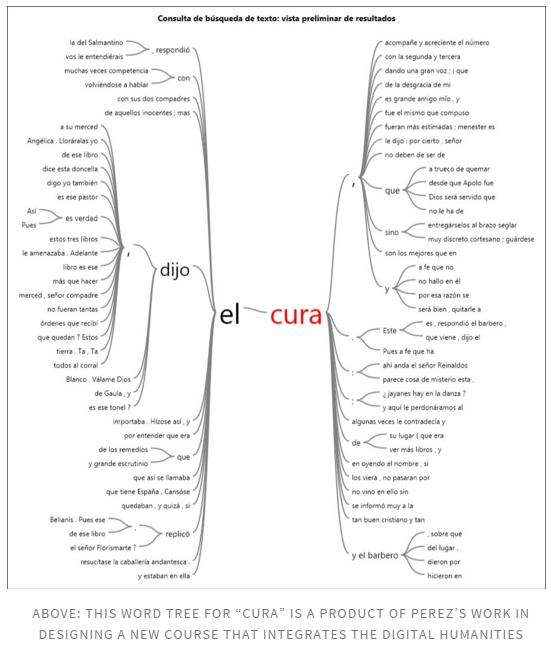 When Spanish Professor Pérez incorporates NVivo, a qualitative research tool, into her teaching of Spanish, she sees it as a way to prepare her students for their future careers. Based on the trajectory of the field, she believes that “the digital humanities are here to stay.” While she realizes that not every student that studies Spanish plans on a career in academia or as a Spanish teacher, she hopes that working with digital technology will prepare her students to adapt to a variety of digital research tools in a wide range of fields. 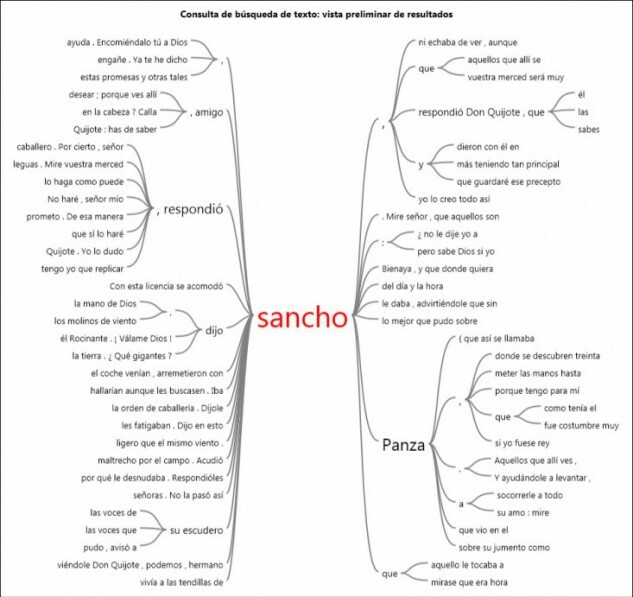 After learning about NVivo, Professor Pérez decided to try using the program in her own research on festival books. Her initial project included only a small number of texts; however, with NVivo’s capacity for large-scale comparison between digital texts, her project has expanded to include around 700 texts. 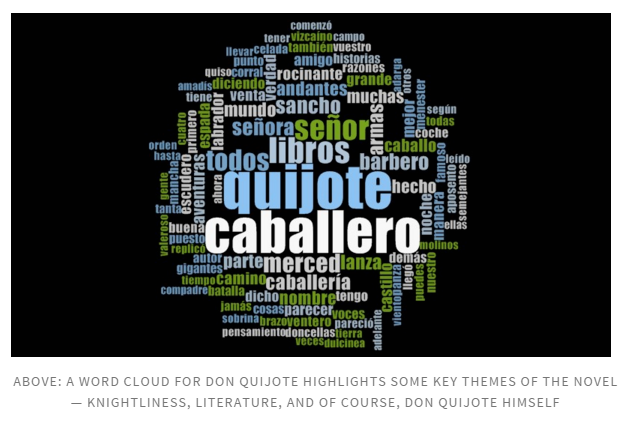 Once she was familiar with NVivo, Professor Pérez decided to include a short assignment using the program in her Spanish seminar focused on Miguel de Cervantes’ classic novel, Don Quijote. SaraSanders ‘14, the 2014-15 DASIL Post-Baccalaureate Fellow, gave an introductory workshop in the class, and Professor Pérez assigned three chapters of the Quijote to each small group of students to analyze digitally. Students then produced reports that included their analytical findings and reflections on NVivo’s usefulness. So far, Professor Pérez has noted differences in how students respond to NVivo: the majority of her science-major students critiqued the program, wishing that it included detailed quantitative analysis, while humanities majors were usually complimentary. Eventually, she hopes to share further observations about the connection between digital technology and pedagogy at conferences and in a published article. As one of the first professors in Grinnell’s Spanish department to utilize digital analysis in her classes, she also hopes that her experiences with the developing field of digital humanities will facilitate other professors’ explorations of new technologies. This past summer, Professor Pérez received a Steven Elkes Grant to develop the use of technology in a new course. With the help of her research assistant, Alex Claycomb ’18, she is in the process of designing a course entitled “Designing Empire: Plazas, Power and Urban Planning in Habsburg Spain and its Colonies,” which integrates two new NVivo assignments as well as work with GIS and mapping.